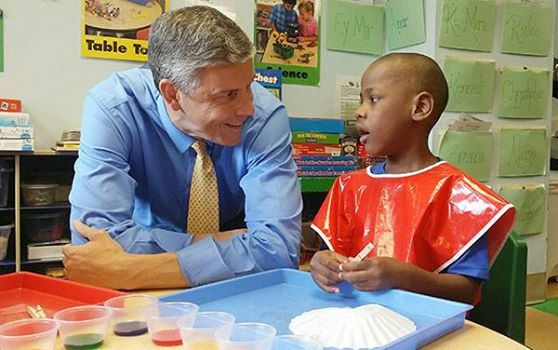 Last week, federal officials announced that applications are available for a new $250 million Preschool Development Grants competition, funding that will help states start new high-quality preschool programs or expand existing ones. Jointly administered by the Department of Education and the Department of Health and Human Services, the program is meant to help close the opportunity gap for the nation’s youngest children. “Preschool Development Grants are not intended to simply add more seats to just any existing state-level program; there is a strong focus on program quality,” Ed Central, a New America Foundation blog, explains. All states as well as Puerto Rico and the District of Columbia are eligible for the program, which offers two types of funding: $80 million in development grants and $170 million in expansion grants. “Under the Preschool Development Grant program, states with either small or no state-funded preschool programs will be eligible for Development Grants,” according to the Department of Education. The eligible applicants are: Alabama, Alaska, Arizona, Hawaii, Idaho, Indiana, Mississippi, Missouri, Montana, Nevada, New Hampshire, North Dakota, Puerto Rico, South Dakota, Utah, and Wyoming. “States early in their development of preschool programs can receive $5 million to $20 million annually for four years, while those with more substantial efforts already in place can receive $10 million to $35 million in the same time frame,” the Wall Street Journal reports. An executive summary offers more details on the program’s rules, eligibility, and funding.